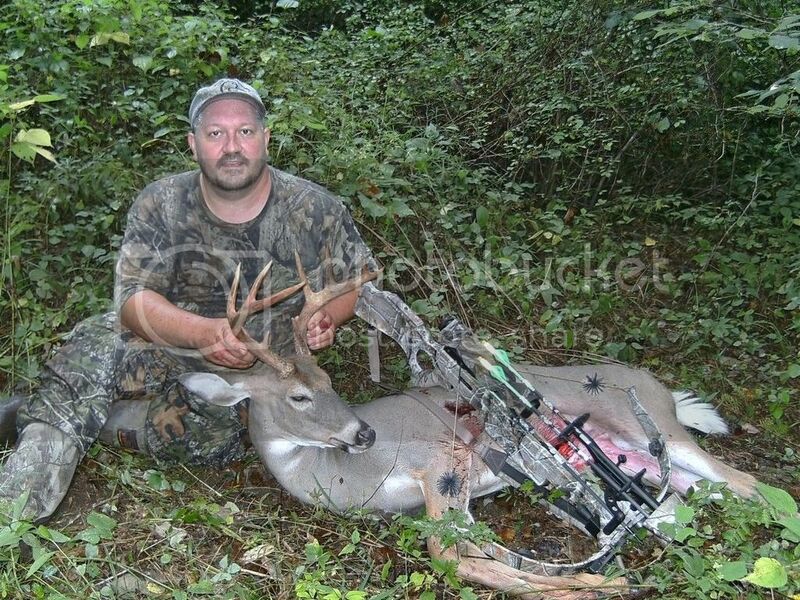 A little late, but I was able to fill my buck tag last weekend, 9/12/15. He wasn't the buck I thought he was when I shot, but I'm still happy with him. He was young, only 2.5 year old. He would have made a good one next year, that's the only bad thing about it. I had gotten pictures last December of a really tall-tined buck that apparently had been shot during the late muzzleloading season. He was shot in the upper part of his right front leg, just below the body, breaking the leg bone there. The deer was really skinny and I didn't figure that he would make it through the year. I got pictures of him on 2 different cameras over 2 days and then that was it. Fast forward to this year. 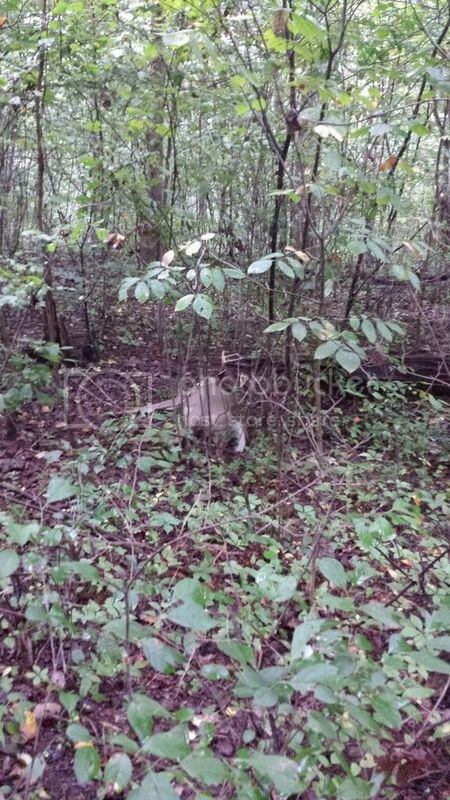 The first week of Sept., I got pictures of a really tall-tined buck that had a broken right front leg that had healed. It doesn't take a brain surgeon to figure out that it was probably the same deer that I had gotten pictures of in December. 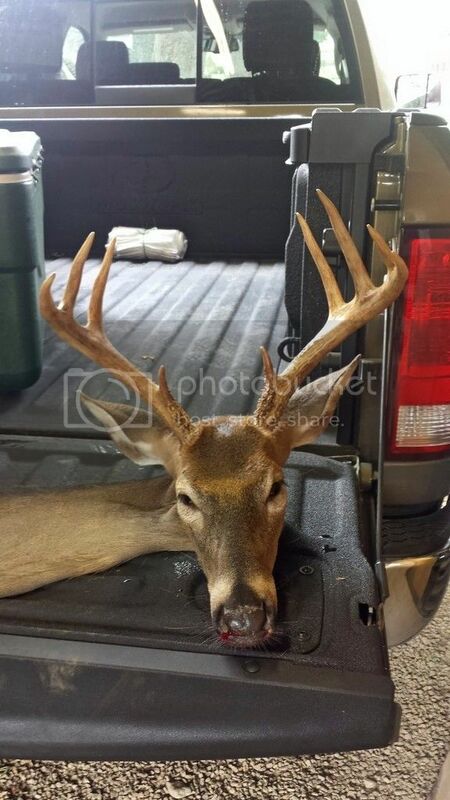 He had a good rack on the right side, but the left side was screwed up a bit from the broken leg. He wasn't the biggest deer that I was after, but I figured that if I got a shot at him I'd take it just to put him out of his misery. Saturday morning it was overcast, so daylight was delayed. I had 3 deer come in, the buck and 2 does. At first, it was so dark that I could only make out outlines. I figured that it was momma and 2 little ones. As I kept watching them though, the "big" one kept running the little ones off. I thought that was weird for a momma to be running off her little ones. I really started looking at the bigger one and could start to make out antlers. I studied him longer and it looked like he had a curve in his leg from it being broken, and the rack looked like the one that had the broken leg. I put the bow up, settled the 20 yd. crosshairs on his chest and squeezed it off. At the shot, he mule-kicked and took off. He ran up the hill in front of me, took a right and then stopped. He started moving again, but I heard him go down. Looked at my watch and it was 7:12 AM. I waited until 7:45 and then came down out of the stand. Where it was overcast, it was still kinda' dark, so I was using a flashlight trying to pick up the blood trail. The leaves were wet from a rain the previous evening, so I never was able to find any blood. I started walking the hill where I heard him running and go down. It took me about 15 minutes to find him. When I walked up on him I knew it wasn't the deer I thought it was. Still a good deer, but I wish he could have lived another year. Since it was still early, I didn't want to mess with my brother's hunting by going and getting him. I walked out, got the 4 wheeler, and pulled it up on the road above where he was. I only had about 40 yds to drag him, but is was uphill. Getting him up on the 4 wheeler was a trick too! I had to pull him up beside the 4 wheeler, use a bungie cord and tie his rack off to the back rack of the 4 wheeler, climb up on top of the 4 wheeler, and then unhook the bungie cord and drag him up on top of the rack. The pictures are deceiving. His body is quite a bit bigger than what it looks like in the pictures. He field dressed at 130 lbs. I'm still debating on whether or not to get him mounted. When I skinned him out, I did it so I could if I wanted to. He's got some really pretty hair, with still some of his red summer hair. But I need another shoulder mount like I need another hole in my head! At least now, I can concentrate on helping the boy fill his tag(s). I hope we can find one of the 3 bucks that I was originally after. That would be cool. Get one of them sneaking through the woods mounts. Btw...You have so many holes in your head now, one more won't make that big a difference. Nice going and nice deer, BC! You certainly did that deer a favor, saving it from being pulled down and eaten alive. Nature isn't gentle. I would consider mounting that buck. Only thing is, you will have to build onto your house so as to add more mounts. Good luck with the boy's hunting. I bet he is more than ready to git er done! You have more deer to hunt for yourself, yes? I've thought about getting a buck and doe mounted together, with the doe licking or nuzzling the buck. I may do that if I can get a doe here pretty soon. Yeah John, I've got 3 more doe tags to fill, plus 4 turkey tags. The boy has 2 deer and 4 turkey tags. Bo, I don't know about the holes in my head, but I definitely have "holes" in the skin of my hands. For some reason I keep trying to cut my dang fingers off. Got about an inch gash on the middle finger, across the middle knuckle of my left hand from where I was cutting up squirrels a few weeks ago. It needed stitches but I didn't want to go to the Dr. It's healing up as it is, but it still looks pretty rough. I did good field dressing the deer and only cut myself once. Felt the knife touch the back of my thumb when my hands were up inside the deer cutting everything lose. That "touch" was enough to put a cut on me. Got everything finished last night as far as the processing goes. I keep the deboned meat in a cooler of ice water, and change the water on it daily. Soaking it out like that improves the taste quite a bit. It usually takes me a week to get one done. I kept track of what everything weighed as I was vacuum sealing the pieces and parts as I went along. Other than a 7 lb. neck roast with the bone still in it, everything was deboned. Figured everything up last night and I came out with 67 lbs. 1 oz. of meat off that buck. Not a bad boneless yeild at all. Time to put your bar-b-que shoes on ! That's a lot of meat And more coming to fill your freezer, BC. Knife must be pretty darn sharp! Is it one this old injun made, perhaps? Knife must be pretty darn sharp! Is it one this old injun made, perhaps? The one I used on the deer wasn't. It was one of the custom Damascus knives I've got. Hadn't used it in a couple of years so I figured I'd take it out. The one I about cut my middle finger off with was one of yours though. Good thing the bone was there to stop the blade, otherwise it would have cut my finger off. Dang, can't loose the middle finger. How would you communicate ? Yow! Good thing bone stopped the cut, huh? That's a nice buck, BC. You're right about how he'd have looked next year though. Sounds like between you and the boy, you'll have enough meet to last you 3, maybe 4 Gutpiler bar-b-que parties. I'll just wait for my all-expenses-paid invite.